In conjunction with our move to our new facilities we discovered a box of this first edition sold out classics. We now have some copies for sale and it is first come first served applies. This is the first edition which includes a bonus CD. 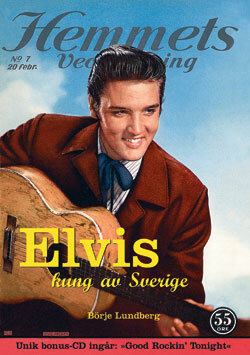 One of many curiosities about Elvis is the fact that the king of rock has extraordinary many ties to Sweden. He was close to take a Swedish wife. His favorite song was Swedish. He called a Swedish girl for "Sweden". His piano player was a Swede. Elvis was a young Swedish girl's penpal. Two Swedish business men tried to make Elvis come to Sweden with the help of the biggest "dalahäst" (traditional craft) in the world... and much much more. "Elvis - Kung av Sverige" features many exciting stories, funny curiosities and uncountable, interesting facts about Elvis and his ties to Sweden. The book includes a complete Elvis-filmography with coloured illustrations of all Swedish cinema posters and excerpts from several film reviews. The book also contains an extensive illustrated discography! For the first time ever more than 400 Elvis records are published in colour! The discography presents both American originals and those records which have been officially released in Sweden. Premiums valuation guide indicates which records are worth a treasure even today! The author Börje Lundberg met Elvis several times. Unique bonus-CD included: "Good Rockin' Tonight"